Click here for this week’s pewsheet and here for our Easter services and events. 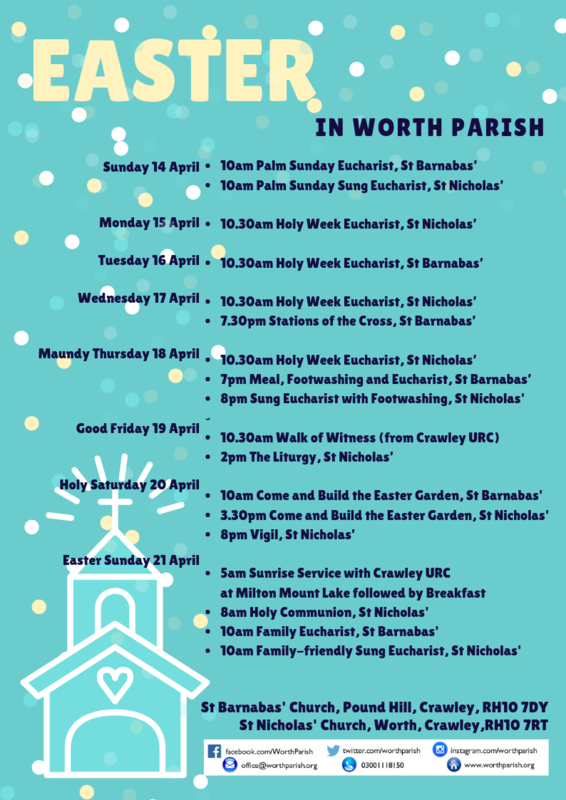 If you’d like to know what we are singing up at St Nicholas’ at our forthcoming services, click here for the music list which covers April, including our Easter services. Help Us Clean St Nicholas’ ! If you would like to come along on Thursday April 4 2019 for a spring clean of St Nicholas’ Worth, RH10 7RT you would be warmly welcomed, between 11 and 2pm. We will provide bacon sandwiches and drinks, if you can turn up with cleaning equipment for brushing and dusting, polishing of wood and brass (and maybe the odd hoover) we would be very grateful. Click here for this week’s pewsheet. Click here for this week’s pewsheet. Note that Next Saturday (23rd) sees our Jumble Sale at St Barnabas’. All our calendar events are shown here. Advance Notice: Our new Youth Club starts 26 April 2019.